One Horizon teams up with Washington-based ENOUGH Project and the General Board of Church and Society of the United Methodist Church to create a faith-based mobilization guide on Darfur. 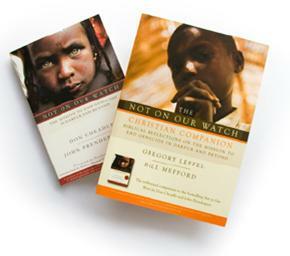 The Not on Our Watch Christian Companion: Biblical Reflections on the Movement to End Genocide in Darfur and Beyond connects churches, fellowships, and individual Christians to the global movement to end genocide in Darfur and other crimes against humanity in Africa. Co-authored by One Horizon president Greg Leffel and GBCS Civil and Human Rights Director Bill Mefford, the Companion expands on New York Times bestseller Not on Our Watch: The Mission to End Genocide in Darfur and Beyond by actor Don Cheadle (Hotel Rwanda) and Africa expert John Prendergast, co-founder of the ENOUGH Project. An important link in the growing Darfur coalition of secular and religious organizations the Companion was initiated at the invitation of ENOUGH Project’s Prendergast. Drawing from the rich Christian humanitarian tradition as well as from traditions of public political involvement, the Companion provides biblical reflections on ethical issues as well as practical guidance for action to create change in Darfur. Each chapter constitutes a weekly study session—eight in all—designed to guide group discussion and reflection about Darfur and the movement to end genocide. Each session includes a biblical passage for reflection, a lesson applying the passage to Darfur, a weekly action step, and vignettes by refugees and people from many walks of life who have awakened to the problem of genocide and become active in the Darfur movement.